Louis-Philippe, Duke of Orleans, later King of the French, Chateau de Neuilly, by 1818[?]-1848. Night is falling over the war-torn field. A wounded soldier sits amidst the debris of a lost battle. On the hillside at the right, corpses bear silent witness to bloody destruction. Indeed, the mound of dirt the soldier sits on reveals a half-buried body—directly beneath him, we can see the top of a head… then outstretched arms… and knees to the right, just beyond him. He alone has survived the horror, and now, oblivious, he leans on his spade, lost in resignation and despair. As gloomy clouds gather above, the pink glow of sunset illuminates the silhouette of a lone cross, marking the grave of a fallen comrade. The mood is reinforced by the downturned torches on either side of the original gilded frame. 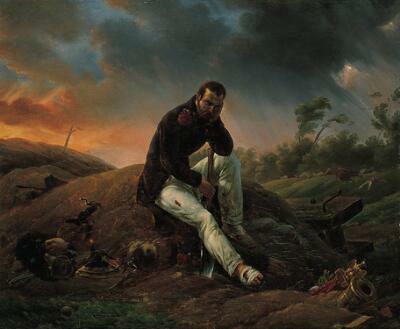 Soldier on the Field of Waterloo by the French military painter Horace Vernet depicts the devastation and futility of war. The artist enlisted a host of devices—characteristic of Romantic landscape painting in the 19th century—to create a mode that is meditative and melancholy. Among them is the solitary figure, silhouetted against a threatening sky that appears to echo the burden of his thoughts. Waterloo, named after a small village just south of Brussels, was fought on a single day in 1815. It was the last battle of the Napoleonic Wars. Under the Duke of Wellington, British, Prussian, and Dutch troops rapidly defeated the French emperor… but the cost was staggering: French casualties alone numbered almost 37,000. Napoleon's disastrous defeat at Waterloo marked the end of his final bid for power—the so-called “100 Days”—and the last chapter in his remarkable career that had transformed Europe. Exiled to the south-Atlantic island of St. Helena, he died only six years later, at the age of 52.